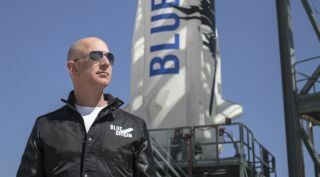 Blue Origin founder Jeff Bezos poses in front of his rocket. WASHINGTON — OneWeb has signed on as Blue Origin's second customer for its New Glenn orbital launch vehicle, both companies announced March 8. Bezos announced Eutelsat as New Glenn's first taker March 7 during a joint appearance with Eutelsat CEO Rodolphe Belmer at the Satellite 2017 conference here. Before inviting Belmer up to the stage, Bezos revealed new details about the reusable rocket. New Glenn's two-stage version is being designed to carry up to 13 metric tons to geostationary transfer orbit, or 45 metric tons into low Earth orbit. Blue Origin anticipates first launch in 2020. OneWeb General Manager Scott Sprague, speaking here March 8, said the New Glenn launch agreement creates options for OneWeb as the company plans for the launch of its first- and second-generation constellations. "It is something that came up as a supplement to what we have in place with Arianespace with Soyuz and with Virgin Galactic," he said. "The core of the network will be launched on Soyuz rockets, but we needed some alternatives and we want to keep driving the industry to provide more choices on the launch side with more cost-effective solutions. I think it's important for all of us to have these, so we are excited about where Blue Origin is headed." Sprague said OneWeb wants to have several launch options in the market for the 882 satellites the form "gen-one" of the OneWeb constellation, as well as the gen-two constellation that could grow by another 2,000 satellites. Eutelsat's contract with Blue Origin covers a New Glenn launch in 2021-2022 with the payload to be selected 12 months prior. In an interview following the panel, Sprague said he isn't sure how many satellites would launch per mission, as it depends on whether New Glenn is used for the first- or second-generation of satellites. OneWeb has previously stated that the mass of the first-generation satellites would be 150 kilograms, but the specifications of the second generation have yet to be decided. OneWeb has 21 Soyuz launches booked with Arianespace, plus options for five additional Soyuz and three of the future Ariane 6 rocket. With Virgin Galactic, OneWeb has 39 missions with LauncherOne, the company's air-launched vehicle that uses a modified Boeing 747 jetliner. OneWeb Satellites, the joint venture between OneWeb and Airbus Defence and Space, is currently contracted to build 900 satellites total.